There can’t be many ingredients less loved than tofu and celery. I don’t share the loathing. Celery is one of those long lasting veggies that can survive the singleton’s fridge. Ready fried tofu I buy at my local Thai supermarket and keep it in a zip loc for a couple of weeks. I really like the spongy texture which soaks up sauces in direct defiance of those who accuse this most versatile of ingredients of blandness. The sauce for this dish is inspired by Fuchsia Dunlop’s Fish Scented Aubergine – a recipe cooked by all those sensible enough to buy her most recent book: Every Grain of Rice. In it she explores the food of the every day kitchen tables of a broad swathe of China. Much of it is vegetarian, so I hope she will approve of this homage. There is no fish by the way…but this saucing is often used for fish, hence the name. I’ve added some rice wine as I love the deep savoury flavour it brings. I had run out of fresh ginger – a finely chopped teaspoon full would definitely enhance it…but the celery has a real strength of character so I don’t miss it at all. The ingredients are all the staples anyone who has a love of Far Eastern food should have in their kitchen cabinet. Just having them encourages quick, healthy eating full of flavour and excitement. So treat yourself and make a trip to buy them. The combinations are endless and once you’ve got them mastered, you’ll be making up your own recipes in no time. Heat the peanut oil in a wok or frying pan. Next, add the celery, leeks and garlic. Stir fry for a minute or so. Add a few splashes of water to create some steam. This will soften the celery and leeks. Once the water has evaporated, remove the tofu and veg to a warm plate. Mix all the other ingredients together except the cornflour paste, vinegar and sesame oil. Into the same wok over a medium heat add the mixture. It will bubble. Add the cornflour and thicken. You’re looking for a syrupy consistency. If it gets too thick, add some more water. Add the tofu and veg back to the wok and allow the tofu to soak up the sauce for a few seconds. 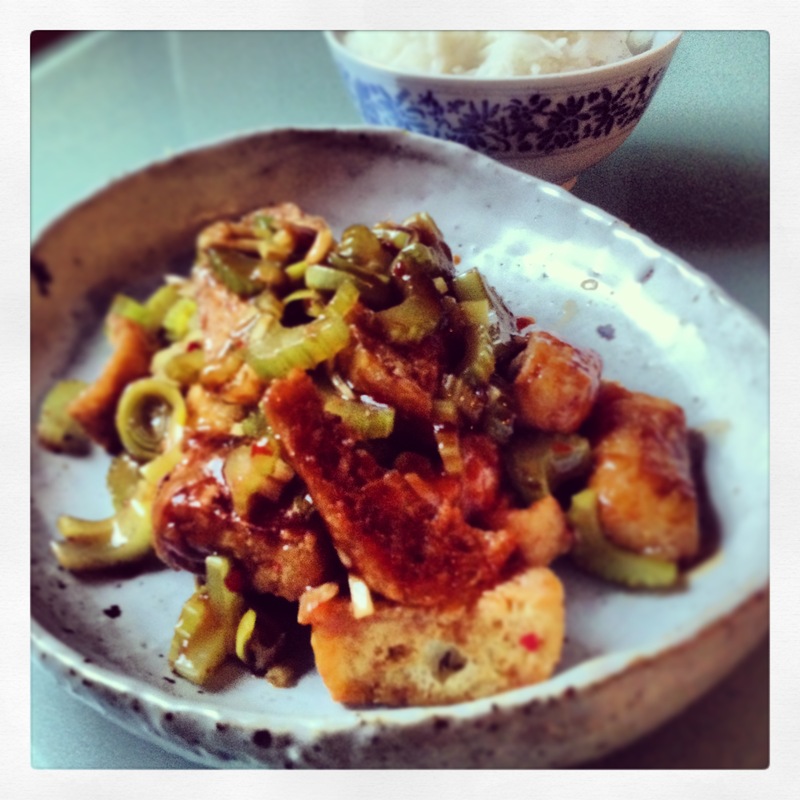 The fried tofu is like a sponge…it makes for great eating as it becomes almost juicy.